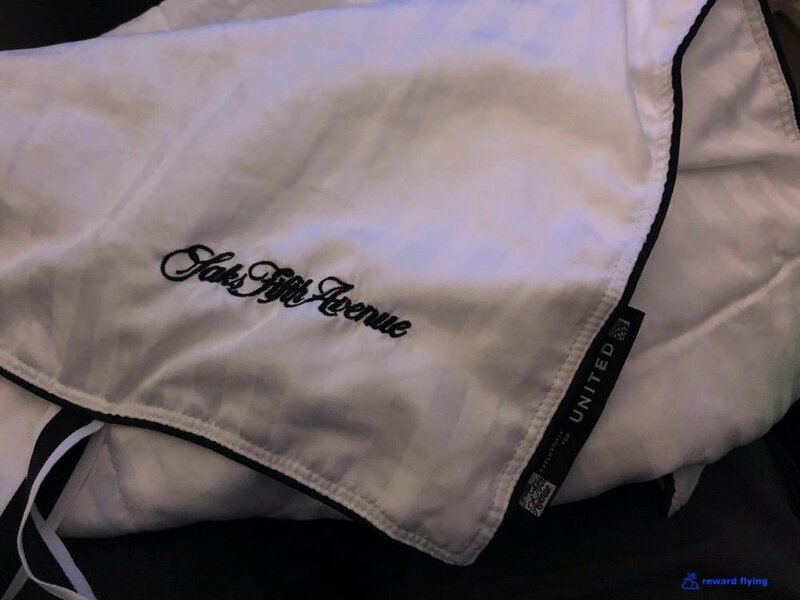 On October 1st, 2018 United announced the inaugural flight of their new Boeing 787-10 Dreamliner. Without much contemplation I decided I wanted to be on this flight. 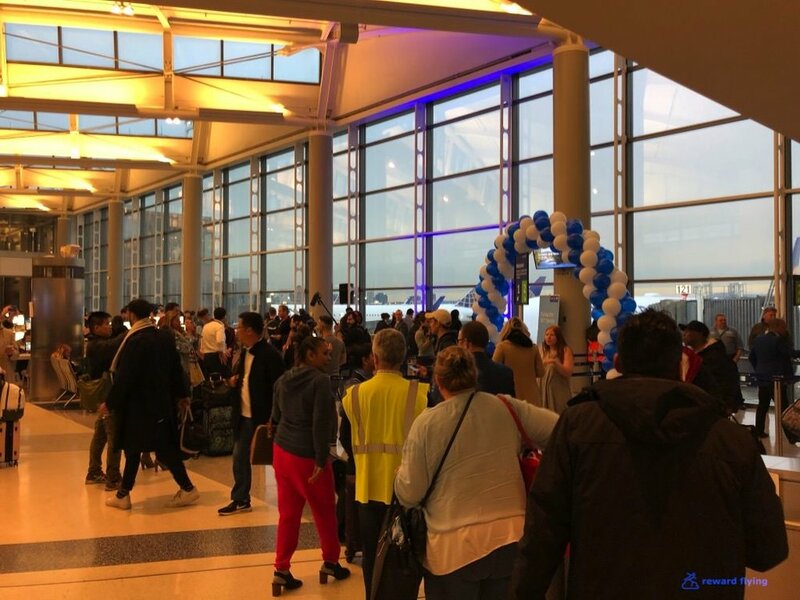 Of course Saver Awards weren’t available but the new “Everyday” award (which have ruined UA’s Mileage Plus program in my opinion but that’s a story for another day) seats were available for a price I was willing to pay given this special event. Since I live in Chicago I had to get to LA. I happened to find an American Airlines combo from ORD to DFW to LAX on their 787-8 and 787-9. Wow! What a trip. My own 787 all variant affair in a row as well; ORD-DFW 787-8, DFW-LAX 787-9 and LAX-EWR 787-10. 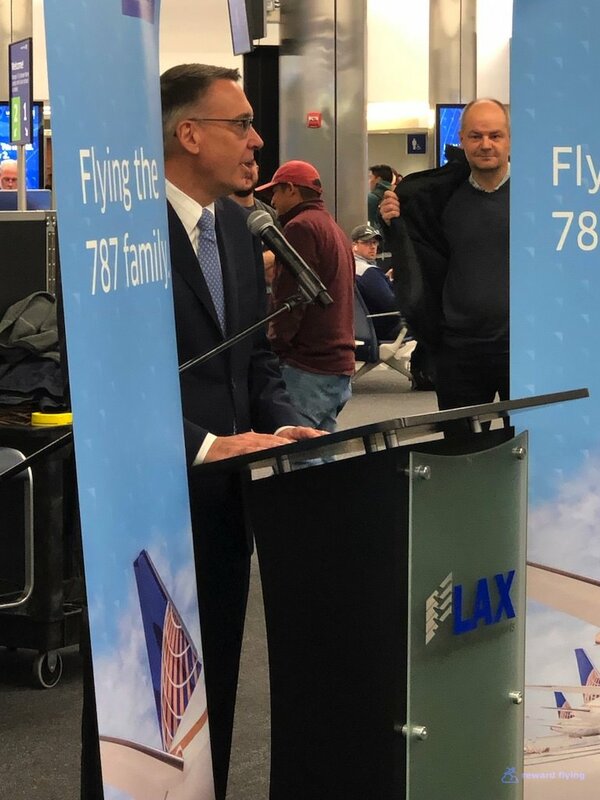 After heavily promoting this inaugural event on 12/20 they flew the 787-10 from LAX-EWR. I contacted United and their excuse was they needed an aircraft because the scheduled one had maintenance issues and it was the holiday season, so this justified flying it. Let me be clear, United owns these planes and they can do whatever they want with them. But over the next 3 weeks I spotted numerous flights flown with the 787-10. Now in a pickle the event was renamed to the “First Scheduled Service Date”. I’m just glad I wasn’t the person who reportedly spend 400,000 or 500,000 points via an auction to fly the 787-10 on this date. I arrived at LAX around 6:30AM and headed straight to the gate. The Polaris Lounge was to open in the coming days, but I couldn’t have entered anyway as it’s reserved for international travel. 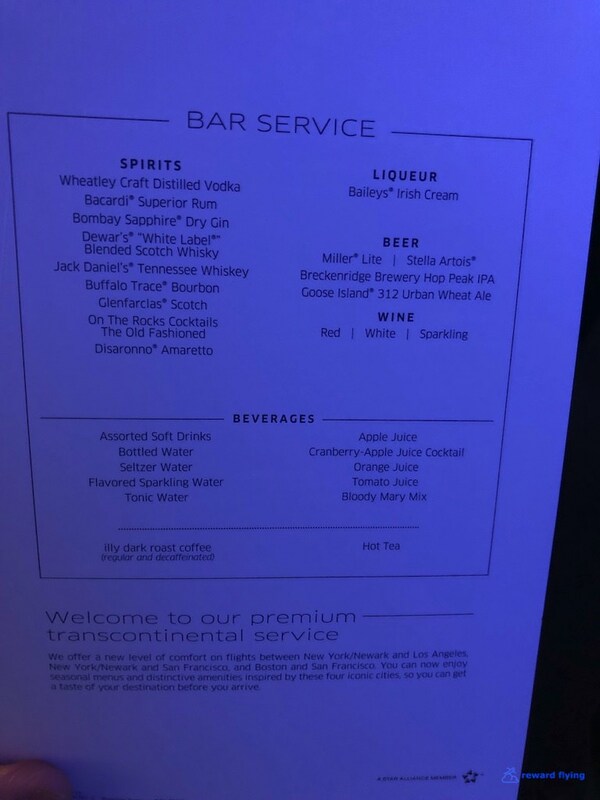 United Transcon ps business class won’t be allowed inside. Apparently it’s not a large facility anyway. Arriving at the gate over an hour before scheduled boarding, avgeeks were everywhere along with UA and Boeing personnel. They had to pretend didn’t they? A Senior United 777 Captain and Boeing Executive spoke for a couple of minutes. The crew, agents along with the Execs photo op. Compare that to the Newark celebration which was set up for the EWR-LAX return flight when we arrived. Food and News reporters everywhere. 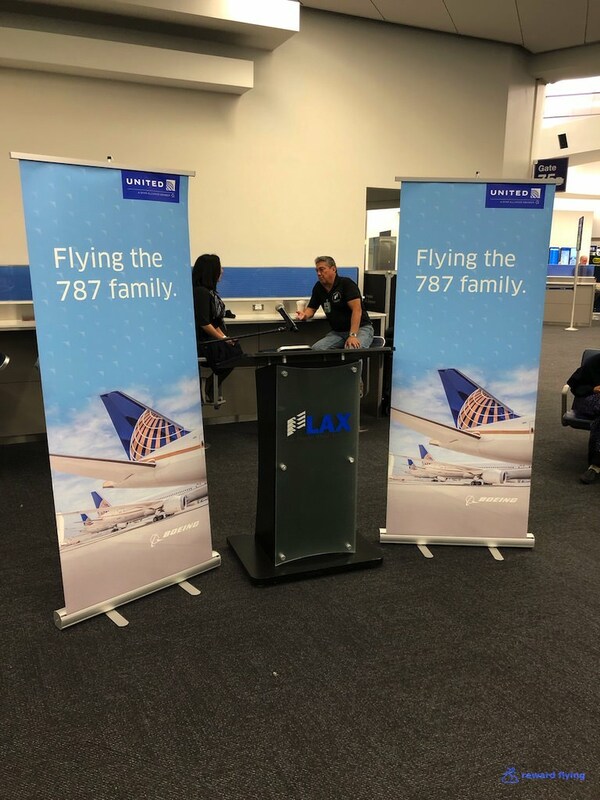 I think LAX "true” first fliers got jipped! After the cabin crew photos, boarding commenced. My first look at the 787-10 cabin as I entered from Door 1. 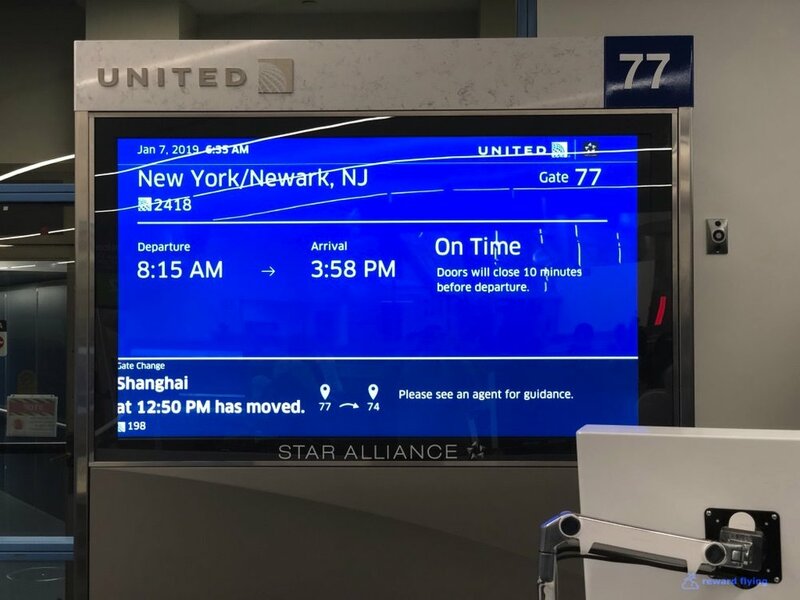 United has a new boarding procedure and it appears they are following it. Since this was a special flight there were plenty of Global Services and 1K fliers and they were all allowed on board, as well as people with disabilities and families. With the status folks boarding first it seemed like half the plane was full before “Group 1” was allowed on. So much for a clean cabin photo. They did let the media on pre-boarding to take photos but I don’t have those credentials. United has a gorgeous aircraft. Different mood lighting for each aisle. The premium economy section was full by the time I got back to take a photo. And while I blurred the faces of passengers, one didn’t look all that pleased with me taking a photo! Classy Polaris plaque on the front bulkhead. The lavatories on this jet were surprisingly small for an international aircraft. This is the one in front of seat 1L. If you pick this seat be prepared for the swoosh of the toilet when it’s flushed and it’s loud. 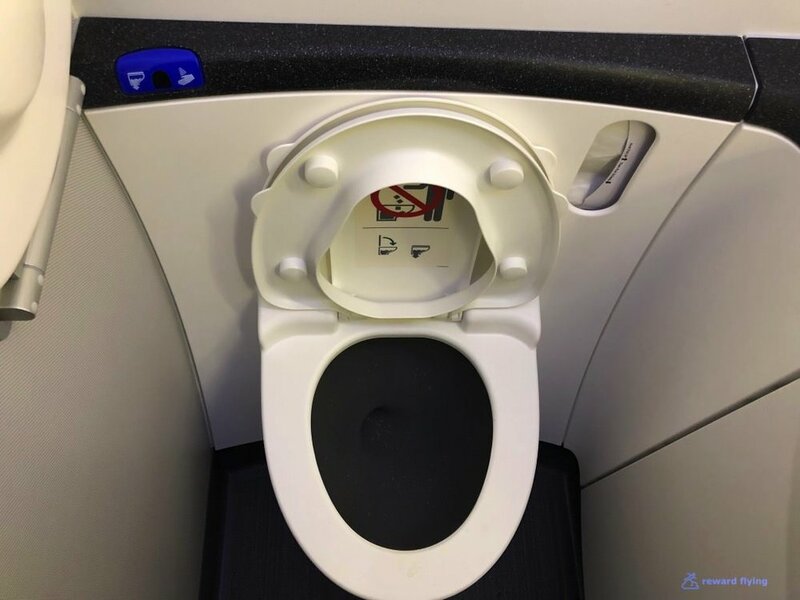 I flew the 787-8 back in 2012 and I recall that there was some kind of automatic flush. 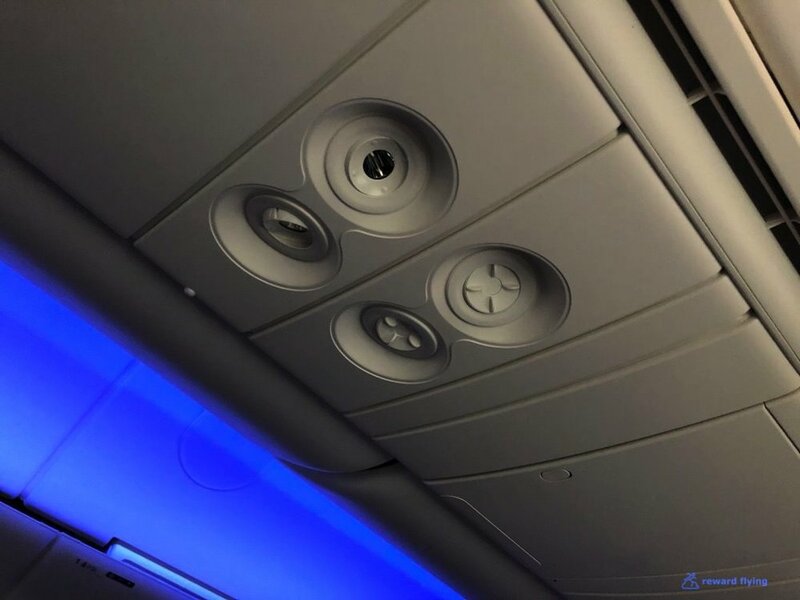 Not so on this aircraft. Also note the lavs weren’t exactly kept spotless during the flight. There are 44 Polaris seats in the front cabin on this aircraft. All seats have a shoulder belt that must be used for takeoff, taxi and landing. Center seats with the privacy divider lowered. These center seats alternate with two next to each other forward facing and two separated angled to the aisle. The footwells in bulkhead seats (1A/1L) are larger and also has better storage underneath. Given the fact that 1L has the lavatory flush to contend with, it seems to me the premier seat on this aircraft is 1A. The galleys seem to be far enough away to not be a noise factor. Having said that, 1 seat out of 44 does not offer outstanding odds of a snag. Forward facing seats are the true window seats in odd number rows. The only issue is the narrow entry into the pod. Polaris seats, at least the true window seats, offer a great deal of privacy. 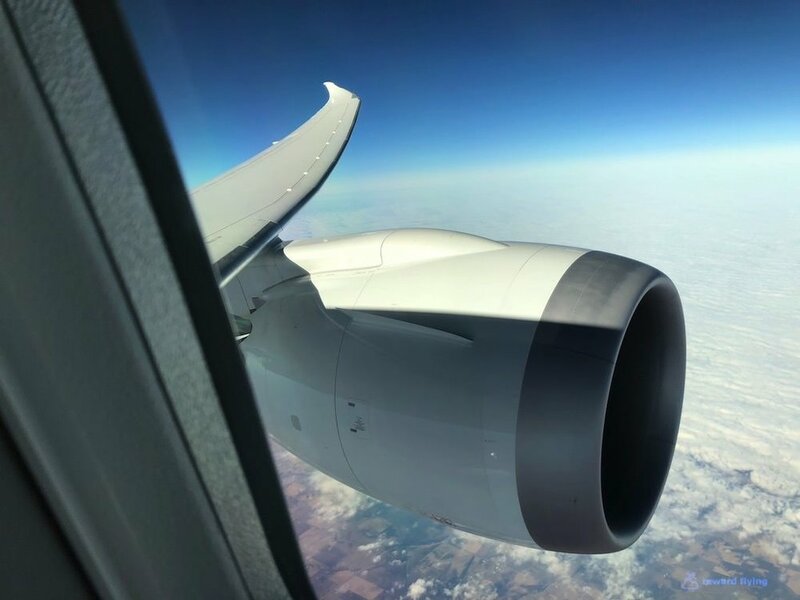 The window tint on Boeing 787’s has been a topic of controversy. The issue is they don’t go completely black. I’d read that this issue had been resolved and when I flew a Qantas over the summer the lowest setting was an opaque black tint. On United that darkest setting looked like this. 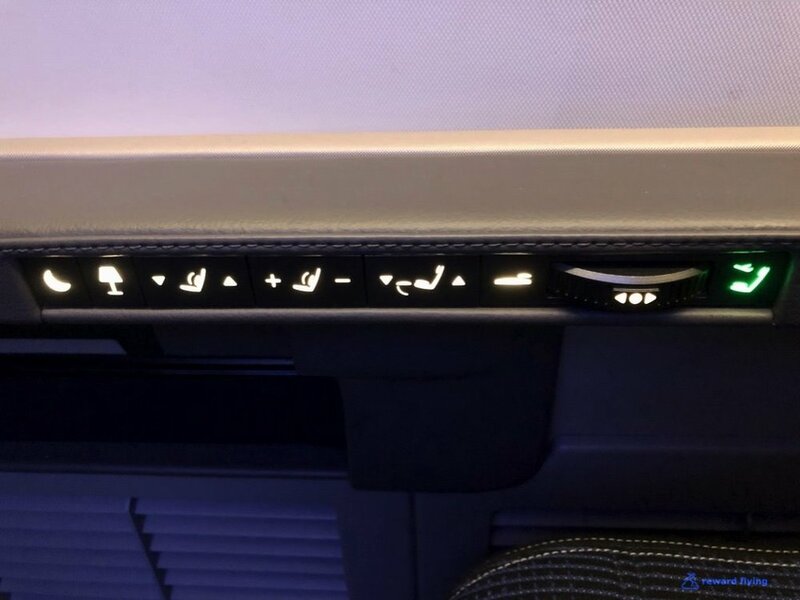 Since UA’s 787-10 should have state-of-the-art up-to date technology I am confused. On the other hand the mechanism might have been malfunctioning as there was a problem with the controls. When my neighbor (hey Scott) darkened his window in 2L, my two windows darkened as well. Teething problems on a new aircraft, but you’d think they would have caught this on the delivery check. The Polaris pod has a decent size tray that slides out from below the monitor. 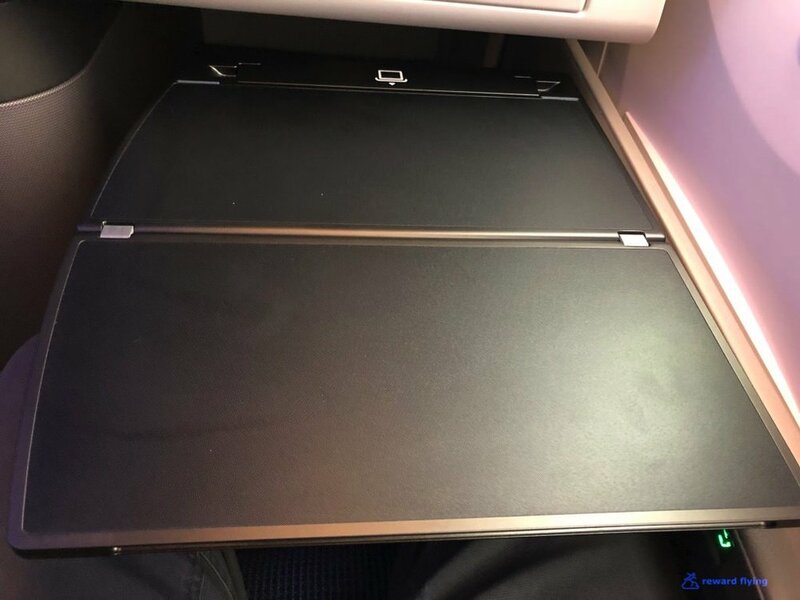 It also has a groove in the back of the tray where you can place your tablet to view United Private Screening. Another innovation on the Polaris pod is the handle you can use to pull yourself up when sitting down. The left armrest is collapsable and inside holds the safety placards. Seat controls are on the other side and on this flight I didn’t find myself accidently hitting the wheel to move the seat as I did on their 777-300 last year. Comparing the two photos it seems the controls on this 787 are set back a bit. Otherwise the pod appears to be identical to the triple 7. Above the table is a small storage for your phone and the United headphones which if you need headphones bring your own. Always a shout out for air nozzles on an airplane as well as some other features of the Polaris pod. It was a rainy morning in Los Angeles as we taxied to the unusual runway 6R for departure to Newark. This Qantas 787 was to follow us to the east coast. It was a bumpy ride today and with a 130 mph tailwind a short ride as well. A printed menu was handed out. Service was fairly slow. It could have been the new aircraft and definitely was due to the ride as the captain had the Flight Attendants in their seats for a period of time. While I’ve flown United many miles, it’s been over a year. I remember they used to have larger mugs for coffee which made perfect sense for an airplane. Now these smaller mugs have the feature of coffee ending up on a napkin during turbulence. However, as you can see the new Boeing 787-10 handled the turbulence quite well. I’m sure all of this is because the larger mug meant too much coffee was being served. For breakfast a fruit and yogurt tray with a small ramekin of granola was served first. Another reason to snag a seat in row 1 is that the cinnamon roll will still be warm. But be advised, eat it fast because once the microwave effect dissipates, the roll isn’t so soft anymore. But it was good for awhile. I ordered the cheese blintzes with berry sauce. Great care was given to the meal presentation. Either I was very hungry or it was good. I ate most of it. All said it was one of the better breakfasts I’ve had on United. On the other hand I heard the person behind me tell the FA his breakfast was “awful”. I think he had the chili verde. No, I didn’t pilfer these. A small amenity kit was on the seat upon arrival which is a nice touch on a domestic flight. The Saks Fifth Avenue blanket is outstanding. There was no mattress pad as this was a daytime domestic flight and I doubt they had the gel pillows on board, but the blanket was great. The IFE on this Polaris seat is nice. Great response to touch, not a great selection of movies, but the Airshow is always my preferred entertainment. However I was EXTREMELY disappointed they didn’t install Channel 9 ATC on this brand new aircraft. 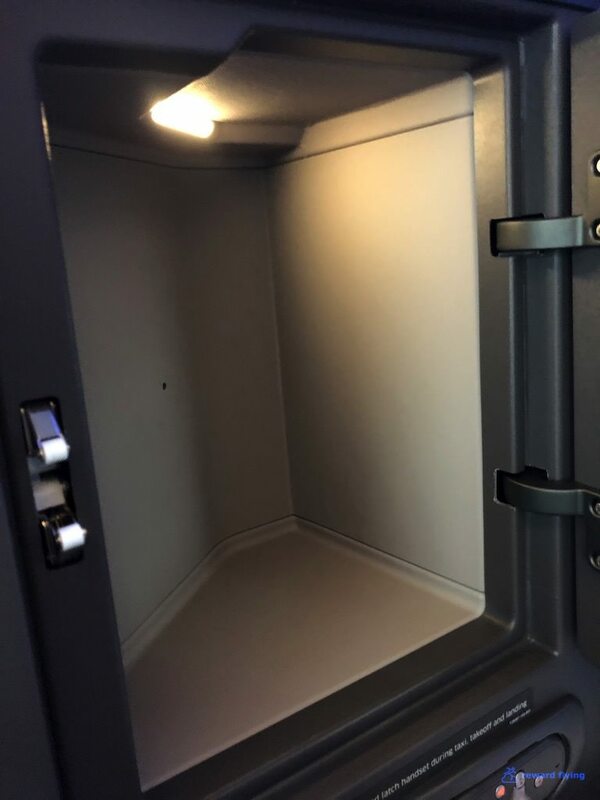 Notice the storage area below the monitor with USB charging port. We also connected the dots on United hubs this trip! The aircraft had WiFi and Private Screening. The prices for WiFi were too high in my opinion. It was almost $30 for the entire 4 hour flight and around $14 for an hour. Silly to spend that just to check the speed and maybe do a little work. The United app did give details about this flight, albeit incorrect details. Mid-flight I had a look around, mostly to get these photos as you can’t see the wing or engines from row 1. Soon after breakfast (the flight was only 4 hours) the snacks were brought out, sandwiches and chips. 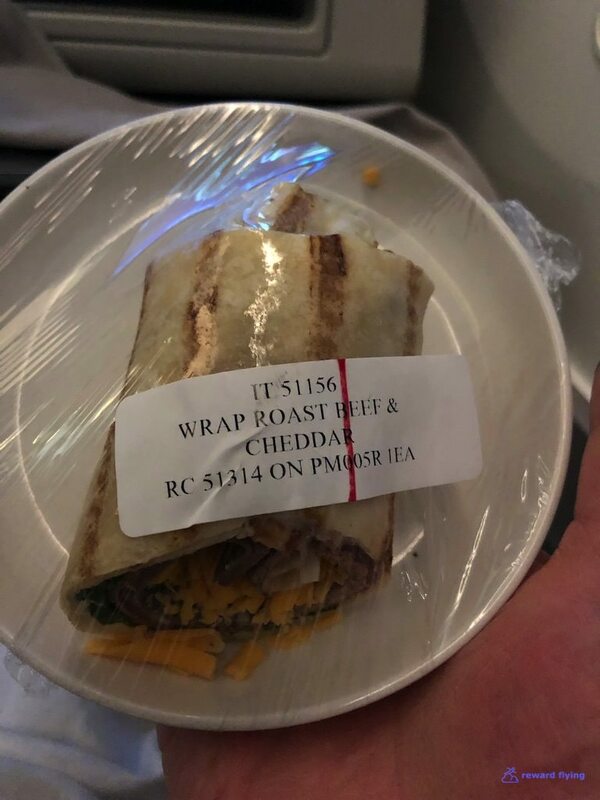 The beef and cheddar was good (at least the inside) as the wrap was a little tough. The middle sandwich, tomato - mozzarella - pesto was terrible, totally soggy inside. And I passed on the bag of chips. I had requested a bottle of water and never received it. Soon we lined up for landing to the north with a nice view of New York City at dusk as well as some interesting sites on the ground. Apparently part of the new boarding process was a new deplaning process, at least on this flight. Business class was allowed to deplane first! On arrival I was able to get some nice photos of this beautiful 787 aircraft. While this flight was fun, I certainly wouldn’t have done it just to fly this aircraft since it required multiple other flights. Yet now I have the UA 787-10 crossed off my bucket list (as well as the AA 787’s). However I wouldn’t hesitate to fly the UA 787-10 again if the opportunity arose. This is a great airplane, they just need to improve their service a bit, along with the food. 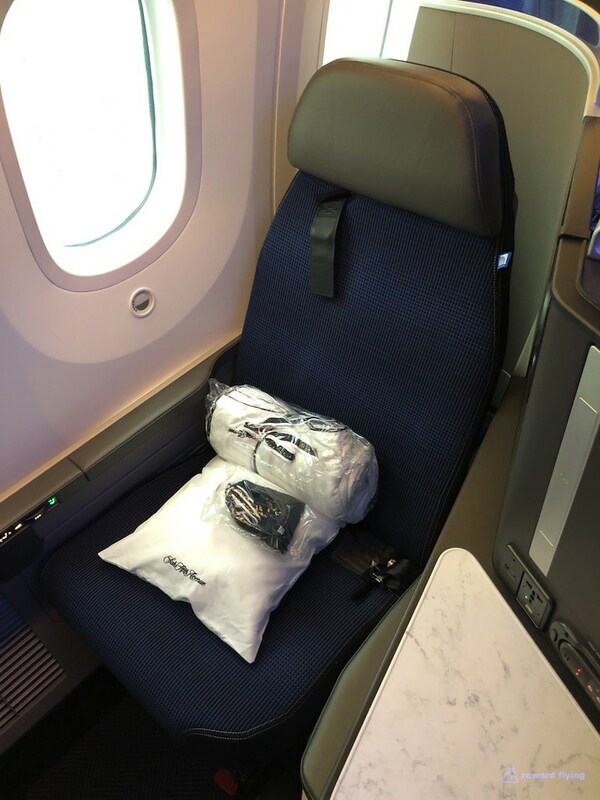 Domestic Saver Awards are 25,000 in first class with a 10K bump for premium transcon service. Everyday awards are 50K plus the 10K bump. That’s what I paid 60,000 points. Too much. 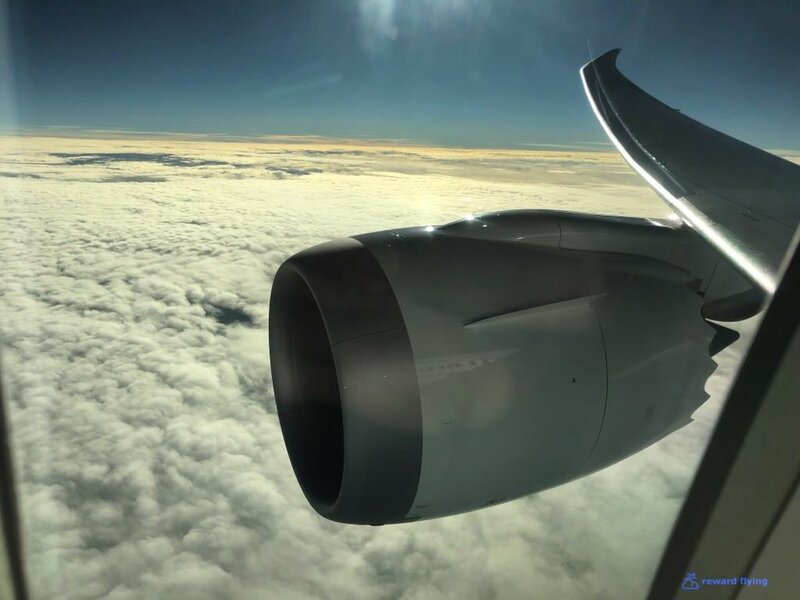 ✔︎The Polaris cabin on this Boeing 787 is beautiful. ✔︎Polaris pods are very nice. 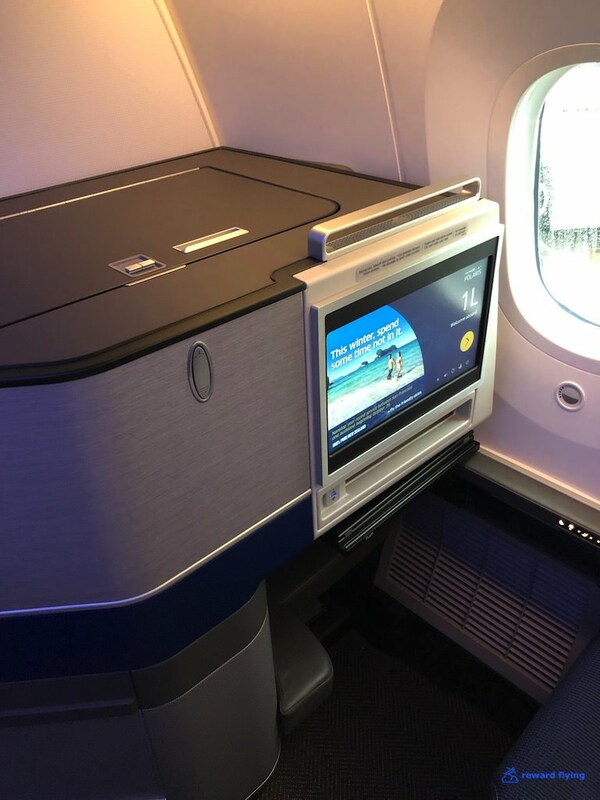 After flying 2 other domestic 787s, American’s Super Diamond and Concept D, these seats are just as good. 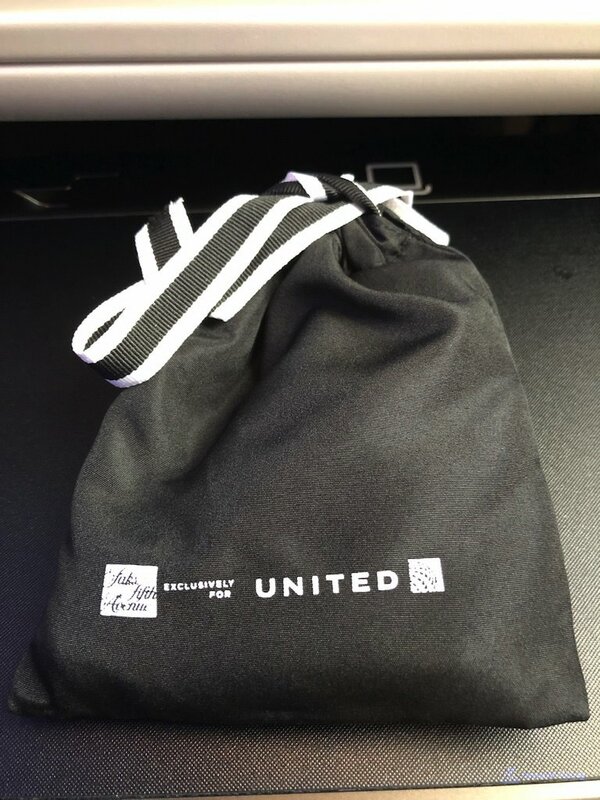 ✔︎The mini Amenity Kit was a nice touch on a domestic flight. 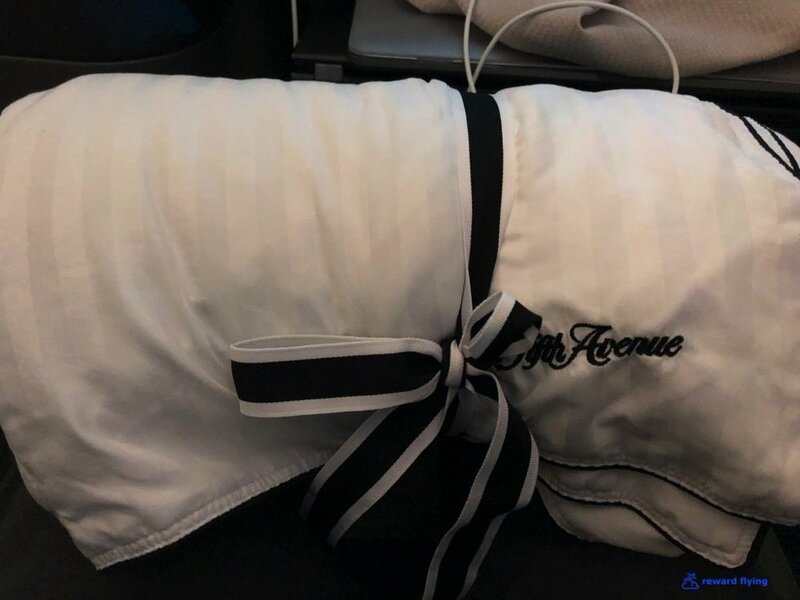 The Saks Fifth Avenue blankets are some of the best of any airline I’ve flown. ✔︎The food was fair, for United standards maybe a little above. ✔︎ Screens were responsive to touch. While not the biggest screens in the air, the way you are positioned to view makes them great for HD movies as the clarity is outstanding. However the content was limited on the aircraft options, more available with Private Screening on your own tablet. Why no Channel 9? ✔︎My flight attendant was not terrible but certainly wasn’t upto international standards. Didn’t bring water, service was slow (maybe due to weather) and food plating was sloppy. But I’ve had worse on United. ✔︎Boeing 787-10. This was United’s first 787-10. Awesome aircraft however it is louder than the 8 and 9 variants. No surprise given the need for larger engines on this bigger airplane. Also the ride was probably smoother as the plane had to contend with 100 MPH winds for most of the flight. While we had some bumps, overall it wasn’t that bad. This flight ranked pretty well against other wide-body aircraft in the regional business class list. 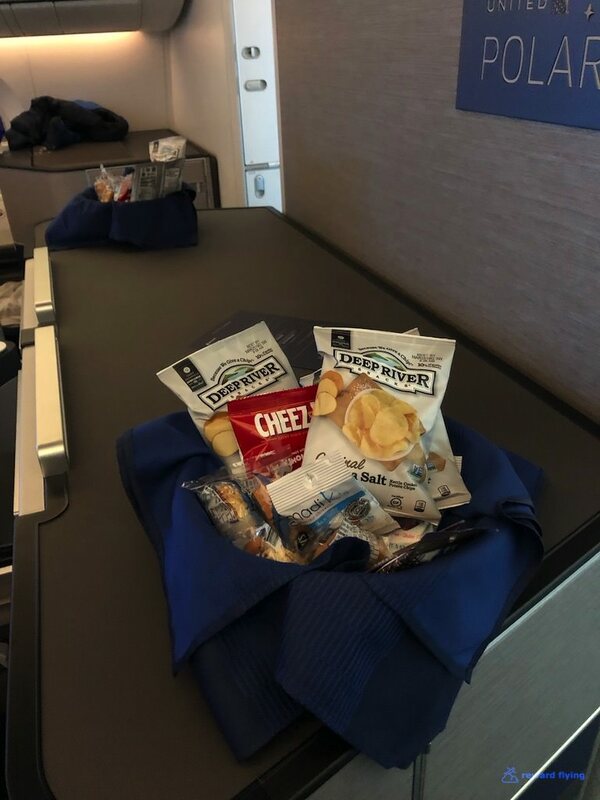 Of course a brand new airplane helps, but I like the Polaris seat overall and the food/FA on this flight was above UA’s typical experience in my view.